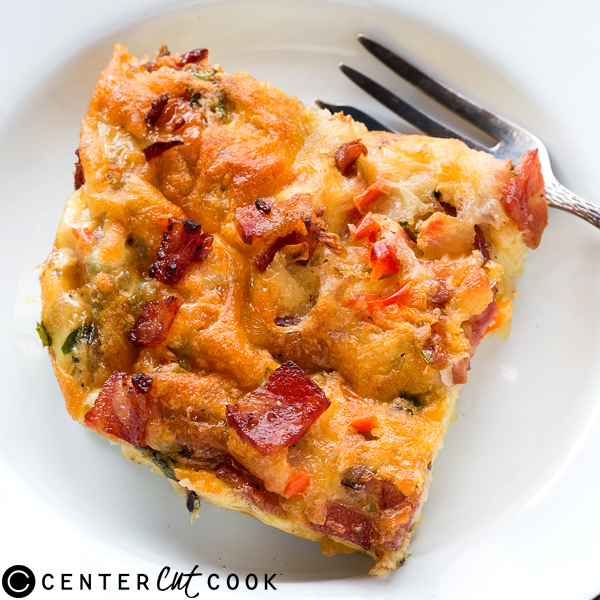 This egg and bacon breakfast casserole is easy and everything you need for a great breakfast! Bread, Eggs, Bacon and lots of cheese – this recipe is a keeper! This Valentine’s Day we decided to stay away from anything mushy. Infact we have plans to just watch netflix and spend all day in bed. 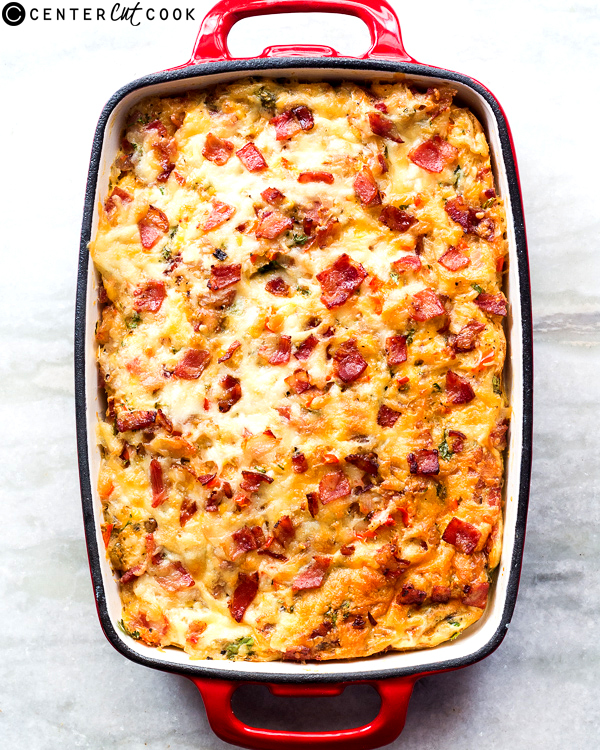 But first, this egg and bacon breakfast casserole. Because both of us can’t do without a breakfast. Is that even romantic? Yah it is. When there’s smoky bacon and gooey cheese involved, everything can be romantic. And this casserole more so, because this breakfast can be enjoyed in bed without any spilling. I’m the clumsy one and that’s always a criteria for breakfast in bed. This casserole is perfect for so many reasons. It’s got everything you need for breakfast but without tons of effort. Layered with bread and topped with eggs, bacon, cheese and veggies, it’s hearty, filling and a crowd pleaser if you have friends or family over. Also perfect for holidays – easter, christmas, thanksgiving etc.! Pre-heat oven to 350 degrees. Grease a 9X13 baking dish with butter and set aside. Cut the bacon into 1/2 inch strips. Heat a pan or skillet and cook bacon till golden brown but not crisp. Once the bacon is cooked, remove with a slotted spoon and add onions, garlic and peppers to the remaining fat. Cook for 3-4 minutes and switch off the flame. Whisk together eggs, milk, salt and pepper. Stir in 3/4 of the bacon, 1 cup cheese and all the vegetables. Cut the bread into 1 inch cubes and line evenly on the baking dish. Pour the egg mixture on top and press down gently till all the bread is soaked. Place in the oven and bake for 20 minutes. After 20 minutes, top the casserole with remaining cheese and bacon. Bake for another 15-20 minutes till the eggs are firm and cooked through. Let the casserole sit for 10 minutes. Slice into squares and serve. The casserole can be prepped ahead and placed overnight in the refrigerator till ready to serve. Extras can also be frozen and reheated.